Frederick Walker ARA RWS (1840-1875) was a British social realist painter and illustrator described by Sir John Everett Millais as "the greatest artist of the century". Walker was born at 90 Great Titchfield Street, Marylebone in London, the elder of twins and the 5th son of William Henry, Jeweller, and Ann (née Powell) Walker - he was one of 8 children. 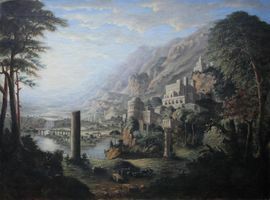 His grandfather, William Walker had been an artist of some merit, who had exhibited regularly at the Royal Academy and British Institution between 1782–1802. Fredrick's mother was an embroideress, and became the family's chief breadwinner when his father died in 1847. Walker received his education at a local school and later at the North London Collegiate School in Camden. He showed a talent for art from an early age teaching himself to copy prints using pen and ink - he also practiced drawing in the British Museum. From 1855–57 he worked in an architect's office in Gower Street but gave up architecture to become a student at the British Museum and at James Mathews Leigh's art school. In March 1858 Walker was admitted as a student at the Royal Academy, and later that year also became a part-time apprentice wood engraver to Josiah Wood Whymper in Lambeth. It was here that he met fellow artists J W North and George Pinwell. During the 2 years of his apprenticeship he continued to paint in his spare time, in both oils and watercolours. In 1859 he joined the Artists' society in Langham Chambers, and from 1860–65 achieved great success as a black and white illustrator for popular journals of the day such as Cornhill Magazine, Once a Week, Good Words, Everybody's Journal, and Leisure Hour. Much of his work during this period was engraved by Joseph Swain. He was introduced to satirist and author William Thackeray, the Cornhill's editor, for whom he provided drawings (e.g. "Comfort in grief") for "The Adventures of Philip", initially published as a serial but then as a book in 1862. He also illustrated Thackeray's unfinished novel "Denis Duval", magazine stories by Thackeray's daughter Ann Ritchie (many of these drawings later reproduced in watercolour), and provided drawings (e.g. "Summer days") for the Dalziel brothers which appeared in 2 poetry books, "A Round of Days" and "Wayside Posies". Walker produced his first important watercolour, Strange faces in 1862 (Yale Center for British Art, New Haven), and in the following year Philip in Church which won a medal at the Paris Exhibition of 1867. Walker exhibited at the Royal Watercolour Society from 1864 until the end of his life, becoming an associate member in February 1864. He was later made a full member in 1866, which entitled him to add the postnominal initials 'RWS' after his name. He was also elected an honorary member of the Belgian Watercolour Society in 1871. In 1863 Walker exhibited his first oil painting, The Lost Path at the Royal Academy of Arts, and thereafter showed Wayfarers (1866; Private collection), Bathers (1867; Lady Lever Art Gallery), Vagrants (1868; Tate, London), The Old Gate (1869), The Plough (1870; Tate, London), At the Bar (1871; Untraced), The Harbour of Refuge (1872; Tate, London) and The Right of Way (1875; National Gallery of Victoria, Melbourne). In 1871 he was elected an Associate Royal Academician (ARA). Walker never married and lived all his life in London with members of his family - brother John (d. 1868), sister Fanny (d. 1876) and mother (d. 1874) - residing in Bayswater from 1863. He twice visited Paris (in 1863 and 1867) and Venice (1868 and 1870 - in the latter year with his friend William Quiller Orchardson). In 1873 he travelled to Algiers in an unsuccessful attempt to recuperate from a bout of tuberculosis, which gradually worsened until his death in June 1875 at St Fillans in Perthshire, Scotland. He was buried at Cookham.